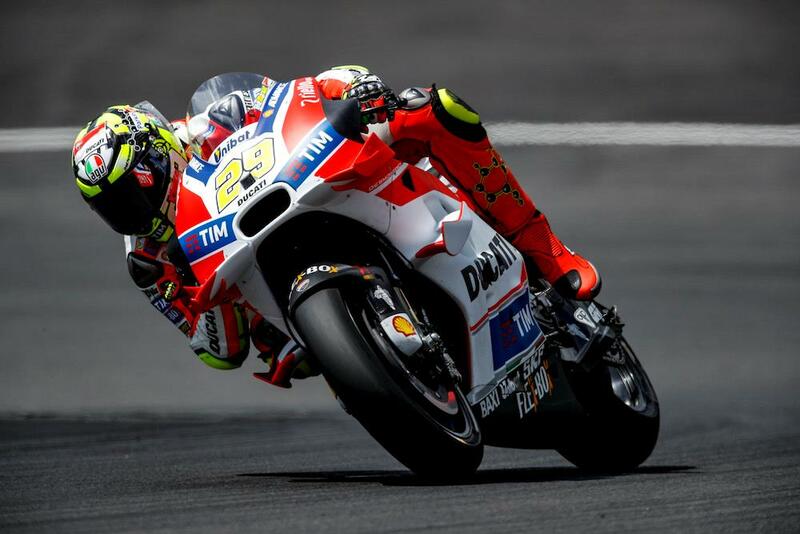 Ducati continued to dominate as the two-day MotoGP test at Austria’s Red Bull Ring drew to a close today, with Andrea Iannone taking charge at the top of the timesheets from team mate Dovizioso. It was a Ducati lockout at the top with factory test rider Casey Stoner coming in third fastest despite a fall towards the end of the day, with Avintia’s Hector Barbera rounding out an all-Ducati top four. Valentino Rossi was fifth fastest but almost a second off the time set by his compatriot, fractionally ahead of team-mate and championship rival Jorge Lorenzo. The Suzuki duo of Maverick Vinales and Aleix Espargaro ranked seventh and eighth, with Scott Redding and Yonny Hernandez competing the top ten. Honda’s representation continued to struggle on Wednesday, with Cal Crutchlow the leading RC213V over a second off Iannone’s pace. The Repsol Honda team did not participate in the two-day private test. KTM continued to impress as the RC16 made an appearance on track with MotoGP rivals for the first time, with test rider Mika Kallio under two seconds off the top of the timesheets. Aprilia were also present at the test, with factory rider Alvaro Bautista and test riders Sam Lowes and Mike de Meglio. The Noale factory opted against running transponders leaving times unknown, but it’s thought Sam Lowes made considerable steps forward on just his second MotoGP outing. Riders will now be able to enjoy their three-week summer break before the season resumes next month at the Austrian track.